Original Medicare, Parts A and B, have significant gaps in prescription drug benefits. In fact, these Medicare plans won’t cover most medication you will need, unless you receive them as a hospital inpatient. If you want prescription drug insurance coverage, you will need to enroll in a Medicare Part D plan. The Medicare experts at United Medicare Exchange are here to help you buy Medicare Part D plans. We’ll help you compare your different options and find a solution that’s tailored to your specific needs. Call today to get the answers you need. Ready to Enroll in New York Medicare Prescription Plans? After finding your prescription costs, look up the premium costs for the Medicare Advantage and Medicare Supplement Plans available. Add your annual prescription costs to the annual premiums and deductibles of each Medicare Advantage and Medicare Supplement that interests you. This will likely be your minimum health care cost if you are healthy. 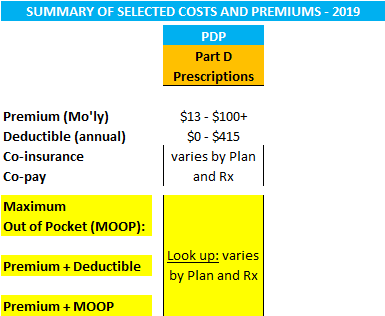 You can add the maximum out-of-pocket costs for each Medicare Advantage and/or Medicare Supplement Plan to your prescription and premium costs. This will illustrate your possible highest costs if you have a major accident or health event. Then decide which coverage alternative is most appropriate and affordable. Copyright © 2017 United Medicare, Inc.